In 2011, a tooth from the Peking Man was found in a box at the Museum of Evolution at Uppsala University. In the latest issue of Acta Anthropologica Sinica, researchers at Uppsala University and a Chinese research institute have now published their analysis of the tooth. The discovery gives us new knowledge about one of the most mythical ancestors of the modern man. When 40 old, forgotten boxes were found and unpacked by Per Ahlberg, Martin Kundrát and curator Jan Ove Ebbestad in 2011, the tooth was one of the most interesting finds. Two Chinese paleontologists, Liu Wu and Tong Haowen from the Institute of Vertebrate Palaeontology and Palaeoanthropology (IVPP) in Beijing, were invited to study the tooth. 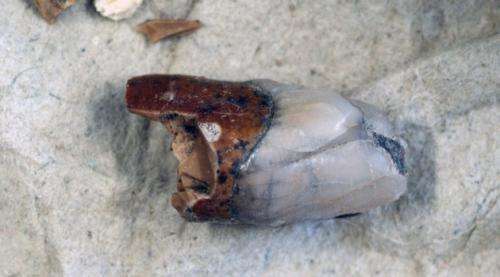 They could quickly determine that it was a canine tooth from a Peking Man. 'It is a spectacular find', says Per Ahlberg. 'We can see numerous details that tell us about this individual's life. The crown of the tooth is relatively small, which indicates that it belonged to a woman. The tooth is quite worn, so the individual must have been quite old when she died. In addition, two large chips have been knocked out of the enamel, as if hit by something, or perhaps by biting into something really hard such as a bone or a hard nut. At least one of the chips was old when the individual died, since it is partly worn down. One of the 20th century's great palaeontological discoveries was the fossils of the Peking Man, Homo erectus, in deposits some 500,000 years old in caves in Zhoukoudian near Beijing. The very first samples of this prehistoric man, two teeth, were found in the 1920s by Otto Zdansky from Uppsala University and can now be found at the Museum of Evolution in Uppsala together with a third tooth discovered in the 1950s among the fossils sent to Sweden. The discovery of the Peking Man became a world sensation. In 1927 the excavation by Zhoukoudian was taken over by Wenhao Weng of the Geological Survey of China and Canadian Davidson Black. Under their leadership a wealth of specimens such as crania and other bones were discovered, but this unique collection disappeared during the chaos of the second world war and has never been found since. Over the last decades, several fossils of Homo erectus have been found in other parts of the world. 'We now know that the species is a direct ancestor to the modern man. However, the lost materials of the Peking Man remain one of palaeontology's greatest mysteries and most tragic losses', says Per Ahlberg. The story took an unexpected turn. The materials that arrived in Uppsala from China in the 1920s were so extensive that the researchers didn't have time to study it all. Some boxes were never unpacked and remained so until 2011 when Martin Kundrat, Jan Ove Ebbestad and Per Ahlberg at Uppsala University began investigating their contents. Several of the boxes turned out to come from Zhoukoudian, and in one of them Martin Kundrat found a seemingly human tooth. The find is now described in Acta Anthropologica Sinica, a scientific journal published by the IVPP.